These crispy & crunchy coconut cookies are so addictive- and easy to make too! Roll 1 TBS mix per biscuit into a ball and then flatten in the palm of your hand to create cookie. Notes... If you want them super crunchy, flatten quite thin and allow to cook slightly longer. If you prefer a slightly softer Centre, leave them a bit thicker in the Centre and only cook until just golden. I can taste the flavour just looking at them. Thanks for the recipe. my kids would love these! I think we shall make them on the holidays! Love the look of these and will be getting everything ready to make. Love coconut,these cookies would be delicious,thanks! love these – thank you for the recipe – going to whip up some this weekend! 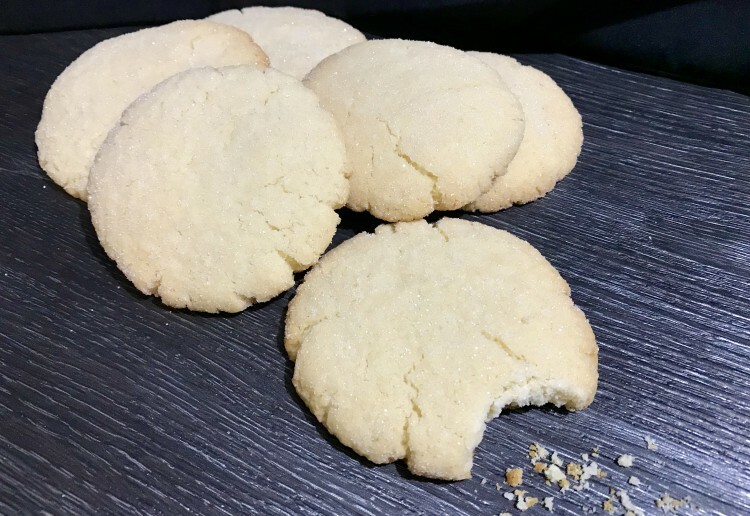 Love coconut and love cookies – so love the look of these cookies! That extra sugar on tops make them look even more delicious!! It makes them so pretty! Ooh, these sound super easy and quick, and look delicious – will definitely cook up a batch this weekend! Thanks for sharing! Ooo I have all these ingredients at home, I can make some for my kids for school!